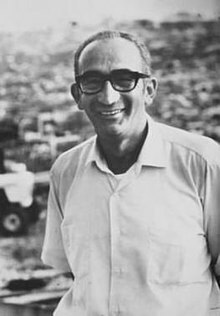 Max B. Yasgur (December 15, 1919 – February 9, 1973) was an American farmer, best known as the owner of the dairy farm in Bethel, New York, at which the Woodstock Music and Art Fair was held between August 15 and August 18, 1969. At the time of the festival in 1969, Yasgur was married and had a son and daughter. His son, Sam Yasgur, was an assistant district attorney in New York City at the time. Yasgur was 49 at the time of the festival and had a heart condition. He said at the time that he never expected the festival to be so large, but that "if the generation gap is to be closed, we older people have to do more than we have done." Yasgur quickly established a rapport with the concert-goers, providing food at cost or for free. When he heard that some local residents were reportedly selling water to people coming to the concert, he put up a big sign at his barn on New York State Route 17B reading "Free Water". The New York Times reported that Yasgur "slammed a work-hardened fist on the table and demanded of some friends, 'How can anyone ask money for water?'" His son Sam recalled his father telling his children to "take every empty milk bottle from the plant, fill them with water and give them to the kids, and give away all the milk and milk products we had at the dairy." At the time of the concert, friends described Yasgur as an individualist, who was motivated as much by his principles as by the money. According to Sam Yasgur, his father agreed to rent the field to the festival organizers because it was a very wet year, which curtailed hay production. The income from the rental would offset the cost of purchasing thousands of bales of hay. Yasgur also believed strongly in freedom of expression, and was angered by the hostility of some townspeople toward "anti-war hippies". Hosting the festival became for him a "cause". On the third day of the festival, just before Joe Cocker's early afternoon set, Yasgur addressed the crowd. Many of his neighbors turned against him after the festival, and he was no longer welcome at the town general store, but he never regretted his decision to allow the concert on his farm. On January 7, 1970, he was sued by his neighbors for property damage caused by the concert attendees. However, the damage to his own property was far more extensive and, over a year later, he received a $50,000 settlement to pay for the near-destruction of his dairy farm. He refused to rent out his farm for a 1970 revival of the festival, saying "As far as I know, I'm going back to running a dairy farm." In 1971, Yasgur sold the 600-acre (2.4 km2) farm, and moved to Marathon, Florida where a year and a half later he died of a heart attack at the age of 53. He was given a full-page obituary in Rolling Stone magazine, one of the few non-musicians to have received such an honor. In 1997, the site of the concert and 1,400 acres (5.7 km2) surrounding it was purchased by Alan Gerry for the purpose of creating the Bethel Woods Center for the Arts. In August 2007, the 103-acre (0.42 km2) parcel that contains Yasgur's former homestead was placed on the market for $8 million by its current owner, Roy Howard. The Woodstock site had been the locale of frequent reunions. Joni Mitchell's song "Woodstock" (also covered by Crosby, Stills, Nash & Young, Matthews Southern Comfort, Richie Havens, Eva Cassidy, and Brooke Fraser) refers to "Yasgur's Farm". In addition, Mountain (who were also at the festival) recorded a song shortly after the event entitled "For Yasgur's Farm". The band Moon Safari has a song titled "Yasgur's Farm" on their album Blomljud. Yasgur is portrayed by Eugene Levy in Ang Lee's film Taking Woodstock. Sam Yasgur wrote a book about his father, Max B. Yasgur: The Woodstock Festival's Famous Farmer, in August 2009. — addressing a Bethel town board prior to the festival. Michael Eavis, the English farmer who has hosted the Glastonbury festival from 1970. "The Woodstock Story: Max Yasgur"
^ U.S. Census, January 1, 1920, State of New York, County of New York, enumeration district 701, p. 8-A, family 200. ^ "Max Yasgur Tribute Page". woodstockpreservation.org. Archived from the original on August 16, 2009. Retrieved 2009-09-09. ^ "Yasgur's farm for sale ... for $8 million". Associated Press. 2007-08-08. Retrieved 2009-06-13. ^ Yasgur, Sam. "Book excerpt, Sam Yasgur website". Retrieved 2009-09-08.